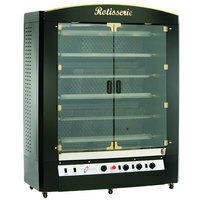 Keep a rotisserie oven in your restaurant, grocery store, or concession stand to offer freshly roasted chicken and kebabs to customers! 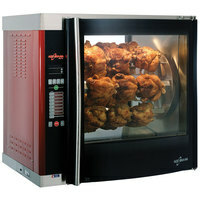 These ovens come in many sizes to accommodate the volume of poultry you need to cook. 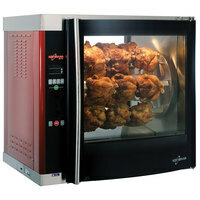 If you offer roasted chicken on your menu regularly, try a unit that can hold several dozen chickens at a time. 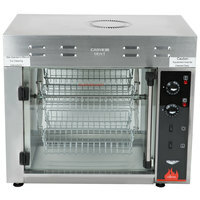 For occasional promotional events at your supermarket, you can use a compact unit that will fit on your deli countertop. 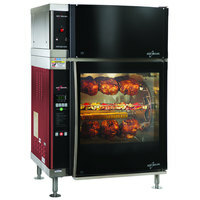 A commercial rotisserie oven rotates cooking food to help it bake evenly and remain juicy. You can find countertop or floor length models to set up against your restaurant's wall, or you can try a pass-through model that allows access from both sides. 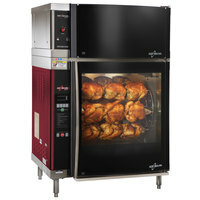 Each oven features several spits where you spear the chicken and leave it to cook. 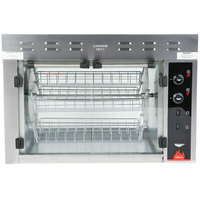 Some units also come with rotating baskets where you can place vegetables.